To customize the default settings for Email Updates and set default recipients for specific types of notifications, click the Preferences button in the main menu,Global Preferences in the submenu, and the Email Settings tab. Reply Address - Enter an email address that you would like to display in the "Reply-to" field in the email updates that are sent out to your leads. Property Update Subject Line - In IDX Broker Platinum, create your own subject line for email updates by switching this toggle to Custom, and entering the text for the subject line into the box provided on the right. Carbon Copy Type - You can choose to receive carbon copies of every email update sent out to your leads, or a daily summary of all email updates. The carbon copies will be sent to the email address specified in the Carbon Copy Address box to the right. Send Property Updates - Set the frequency that IDX Broker will send out Email Updates to your leads regarding new listings, Daily or Weekly. We recommendDaily Email Updates for leads (this does not mean they are guaranteed to be emailed everyday, but that they will be emailed on the same day that a new listing matches their Saved Search, or a change is made on any Saved Property). Sample Email Update - If you would like to see a sample of the Email Updates that your leads receive, you can enter an email address into the field and press "Send Now". After you are finished customizing your options, don't forget to click Save Changes at the bottom of the screen. IDX Broker Platinum offers the feature to customize the signature on emails sent out on your behalf. There is an interface that accommodates this customization. By default this is a "What You See Is What You Get" interface. Type in your signature text or use the buttons to add links to images or websites. If you would like to put in raw HTML code, simply select the button labeled, "Turn WYSIWYG Off". In IDX Broker Platinum and all multi-user accounts, you may also set additional recipient options. 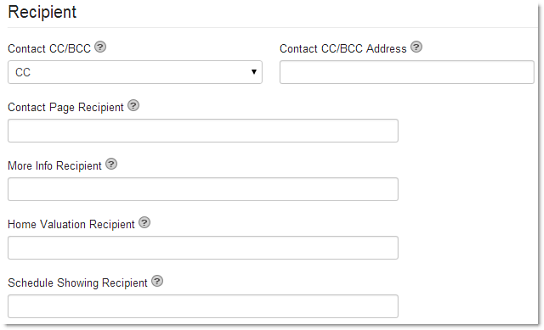 These fields are for setting default recipients for each type of contact page that your site visitors may use to contact you. Additional email addresses can receive communications from leads on your website. Those addresses can be entered under Recipient. You can choose to have them be set as a "Carbon Copy" or a "Blind Carbon Copy" recipient. Each of these input boxes will only allow a single email address. Contact Page - This is the generic contact page for your account, located in your IDX Page Links. More Info - This is the contact form site visitors will fill out when they click on a More Info link from any property detail page. Home Valuation - This is a contact page that sellers can fill out and submit to you if they are interested in working with you to sell a property, also available in your IDX Page Links. Schedule Showing - This is the contact form site visitors will fill out when they click on a Schedule Showing link from any property detail page. If you would like the contents of any of these contact forms sent to a specific email address, simply enter the email addresses into the appropriate fields, and clickSave Changes.